Junior Charlotte Martin slaps a pass upfield during Northwestern’s 5-1 win over Ball State on Saturday. Martin had an assist Sunday in the No. 15 Wildcats’ 3-2 upset over No. 2 Maryland and added three more assists against Ball State. No. 15 Northwestern (6-3, 1-0 Big Ten) ordered some turtle soup over the weekend and boy was it tasty. The Wildcats faced off against No. 2 Maryland (5-2, 0-1 Big Ten) on Saturday, beating the Terrapins 3-2 behind 2 goals from junior Kelley Stump and eight saves from senior Maddy Carpenter. 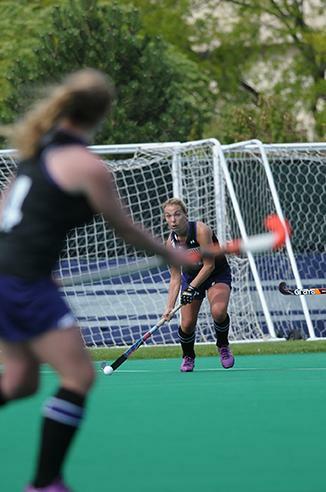 On Sunday, NU took on the Cardinals from Ball State (3-4) and won 5-1. Saturday, Stump was in the right place at the right time all game, forcing a penalty stroke in the crease early in the first half. That penalty stroke led to junior Lisa McCarthy’s goal to put NU ahead 1-0 going into halftime. In the second frame, Stump elevated a shot from junior Charlotte Martin above the Maryland goalie for Stump’s first goal. Her second came from a rebound off a penalty corner. During the week, coach Tracey Fuchs discussed welcoming the new Big Ten school in “Wildcat fashion” — physical, fast play. According to Carpenter, the Cats did just that. To the Terrapins’ credit, they outplayed NU throughout the game with 23 shots, 11 on goal and 12 corners compared to the Cats’ five shots, four on goal and only one corner. On the defensive side, Carpenter was ready for a game against a field hockey titan. In Fuchs’ eyes, Carpenter was a huge difference-maker on Saturday. Against Ball State on Sunday, NU took on the role Maryland was supposed to play. The Cats came out swinging, defeating the Cardinals 5-1 with five different players scoring goals. NU outplayed Ball State with 15 penalty corners and 21 shots with 14 on goal against five penalty corners and nine shots with seven on goal. With a win against a top-five team and a lashing against Ball State, expect the No. 15 Wildcats to jump up a few spots to possibly the top ten in the rankings this week.